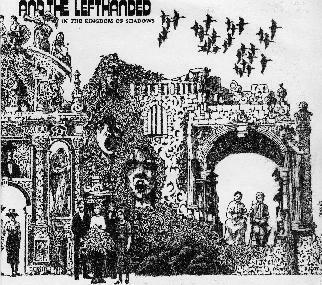 And the Lefthanded - "In The Kingdom Of Shadows"
This is an interesting band from Finland. They started in 1994 as Larry and the Lefthanded but Larry, the guitar player, left in 1999 or so and the band decided to continue on as And the Lefthanded. And the Lefthanded have released a previous 7" and 10" record before this. The band used to be a strange mix of surf, punk lounge soul strangeness. The band have evolved into something completely different. The music is highly original and inspired by the German electro movement like Kraftwerk in many ways. The CD begins with a cool bass driven groove with a cool keyboard line over the top and haunting vocals and a fuzz guitar slowly buzzes in. Disturbing You is one of the rocking songs on the CD, with whispering vocals and a noisy guitar at the end for effect. Rocket Rock is a fantastic tranced out song with a heavy bass line, female vocals and cool keyboards. L.V.K.M 1972 is another sort of jazzy instrumental piece. Cheap Cigar see the return of the guitar and female vocals as well. The repetitive keyboard line gives this one a bit of a poppy feel but is still strange. Carnival is a strange song with harmonica and a hypnotic rhythm. 5½ ends the CD in a very laid back fashion, much like it began. This is a very original band and well worth checking out.